1 There is a cruise for everyone, but choose carefully. If you’re hoping to dance until dawn, it’s unlikely you’ll be happy on a ship where the entertainment consists of academic lectures and a string quartet. Conversely, don’t book a 24-hour party ship if you like to be tucked up in bed by 10. 2 Choose your destination sensibly. Don’t book a cruise to Norway if you love the beach, and don’t do the Caribbean if you’re looking for history and archaeology. 3 Don’t try to cut corners on travel insurance. Ships have hospitals, doctors and nurses, but medical bills can soon add up in case of illness or accident. 4 Check with your travel agent or the cruise line brochure to see what’s included. Gratuities for housekeeping staff and waiters can add a substantial amount to the total cost of your holiday. Even the cost of bottled water can become burdensome. 5 If tips are not included in the fare, they still form a substantial part of the crew’s income. Don’t unfairly withhold payment over some imagined slight. 6 Pack a change of clothes – or at least fresh underwear – in your carry-on bag, just in case the airline loses your main suitcase. 7 For the same reason, medication should also be kept in your carry-on. 8 If you’re flying long haul, travel at least a day early so you can’t miss the boat. 9 Get your bearings by exploring the ship while you wait for your luggage to be delivered to the cabin (take a lift to the top deck and work your way down). 10 An outside cabin, especially with a balcony, is the preferred option for scenic cruising in a region such as Alaska, but inside cabins offer better value. 11 On a long voyage, save on calories by not eating the pillow chocs. Tuck them in a drawer, and if you ever lose track of how many days you’ve been on board, add them up. 12 On your last night, when suitcases may have to be left outside the cabin before you go to bed, don’t forget to leave an outfit for the morning! And shoes. 13 Be prepared to vacate your cabin by 8am on the morning of departure, even if your transfer is hours later. Your cabin steward has to prepare it for the next guests, who could be arriving by lunch time. 14 The first night on board – when many people are content with a buffet supper – can be a good time to eat in a speciality restaurant. They may even cut the prices. 15 Those groaning buffets offer an excess of choice. Unless you’re planning to morph into an American double-wide, there’s no need to pile chicken curry and rice on top of spaghetti Bolognese, roast beef and Yorkshire pudding, garlic shrimp and pizza. Choose one, just like you would at home. 16 On an American ship, “biscuits and gravy” tastes better than you might expect. Grits, on the other hand, are best avoided. If you don’t want to pay extra for fizzy drinks, get used to drinking iced tea; it’s even better half-and-half with lemonade, and they’re both free. 17 Lavish midnight buffets are pretty much a thing of the past. But for those who find a four-course dinner is inadequate, late night snacks are usually available from about 10.30pm. 18 The description “all-inclusive fare” does not usually include bar bills, except on high-end luxury ships. Look out for attractive deals on included drinks packages (at full price, some packages would inflict severe liver damage before becoming financially worthwhile). 19 First thing each morning, take a photograph of the ship’s daily programme. Months later, when the memories have begun to fade, it will remind you where and when each of your pictures was taken. 20 Don’t take everything port advisers say as gospel. Some have detailed knowledge of everything from local history to the best bars. Others are interested only in earning commission from recommending certain shops. 21 Take one of the cruise line’s own excursions and the captain will wait if your bus is delayed. Use a reliable excursion provider and they should guarantee to get you to the next port if you arrive back late. Spend all day knocking back margaritas in Señor Frog’s, emerging to find a big empty quayside, and you’re on your own. 22 Spas and beauty parlours are at their busiest on sea days. Look out for discount deals on port days. 23 If you want to look your best for a formal night, book the hair salon well in advance. Leave it late and you may be unlucky. 24 Don’t deny yourself a visit to the ship’s speciality restaurants. Even with the extra charge, they’ll be a lot less expensive than anything similar ashore, and you’ll probably get better food and service. 25 Chances are you’ll have enjoyed your first cruise so much that you can’t wait to return. 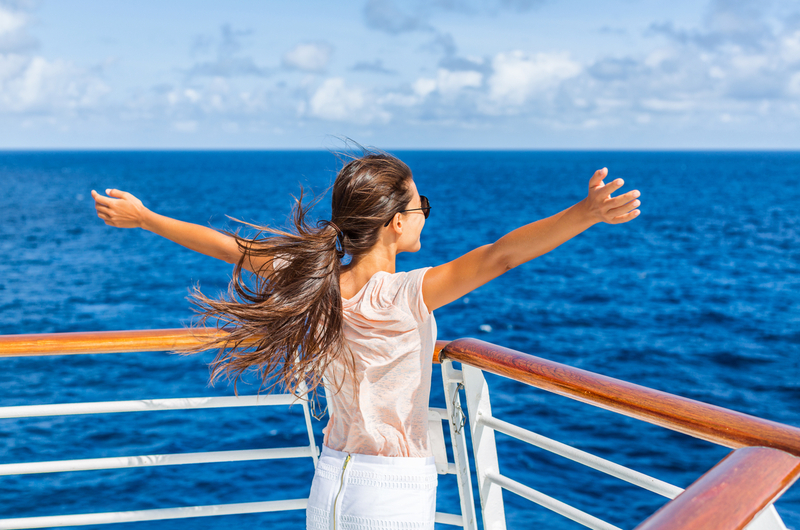 Book your next cruise while still on board and you should qualify for discount fares or perks such as on-board credit.